Bruce Bartlett, who worked for President Reagan, doesn't see Republicans accepting some of the things Reagan did to make tax reform work in 1986. And Obama , he adds, has only taken baby steps. Tax reform. Politicians tout it as fiscal nirvana. It will spur economic growth, curb deficits, reduce income inequality, you name it. But all the happy talk belies the truth about tax reform, which Bruce Bartlett knows a thing or two about, having worked as a senior policy analyst for President Reagan in 1986. That was the last time Washington embarked on a major overhaul of the tax code. Bartlett's latest book -- "The Benefit and The Burden: Tax Reform -- Why We Need It and What It Will Take" -- was written to help citizens understand the tax policy process so they can demand more of their politicians. CNNMoney asked Bartlett for his views on the prospects for real tax reform today. What's the one thing Americans need to know about tax reform that their politicians aren't telling them? I think the main thing is that they can't have something for nothing. Politicians who promise only the sugar of rate cuts without also specifying what medicine in terms of base broadening goes with it should not be taken seriously. 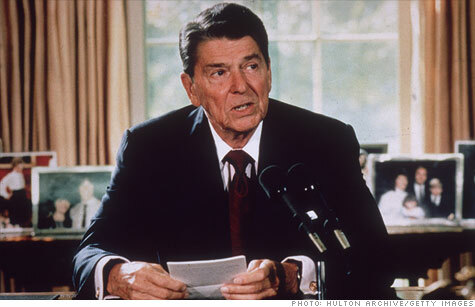 What's the biggest lesson of the 1986 tax reform? I think the biggest lesson is that it is very, very hard to do tax reform even under political conditions far more favorable than today. Today, the basic parameters of tax reform are still being debated, there are no serious options on the table, and the administration has taken only baby steps toward reform. Also, the two parties are far more polarized than they were in 1986, and it is hard to imagine Republicans accepting some of the things Reagan did to make reform work, such as raising the capital gains tax. If you ran Congress, how would you force lawmakers to work out their differences over taxes? I think the most important thing would be to impose a hard requirement that lawmakers pay for any tax cuts, as was the case in 1986. Because of the budget deficit, we cannot afford more tax cuts, period. Therefore, any rate reductions must be fully and honestly paid for with base broadening and loophole closings. And there must be no smoke-and-mirrors, such as "Laffer Curve" nonsense about tax cuts paying for themselves. Of the presidential candidates, which one gives you the most hope that serious tax reform could happen on his watch? No one, including Obama, gives me any hope at this time that they are yet serious about tax reform. One reason is that both sides think they will have a stronger hand after the election, but both can't be right. And in the meantime, no one is bothering to lay the groundwork for serious reform. Quiz: How much do the rich really pay in taxes?